A nondispersive infrared sensor is a simple spectroscopic sensor often used as a gas detector. It is nondispersive in the sense of optical dispersion since the infrared energy is allowed to pass through the atmospheric sampling chamber without deformation. Marinobacter hydrocarbonoclasticus is a species of Proteobacteria found in sea water which are able to degrade hydrocarbons. The cells are rod-shaped and motile by means of a single polar flagellum. The China–Brazil Earth Resources Satellite program (CBERS) is a technological cooperation program between Brazil and China which develops and operates Earth observation satellites. 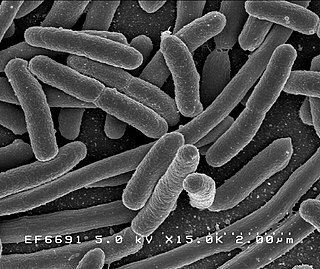 Nisaea is a genus in the phylum Proteobacteria (Bacteria), which contains two species, namely N. denitrificans and N. nitritireducens, which were described in 2008. Thiorhodospira sibirica is a species of alkaliphilic purple sulfur bacterium. It is strictly anaerobic, vibrioid- or spiral-shaped and motile by means of a polar tuft of flagella.